We're not going to pretend Fordham's basketball program has had a whole lot of good days since joining the Atlantic 10 in 1995, but in the past 24 hours they've just about hit rock bottom. First came news yesterday that its best player, sophomore Jio Fontan, has decided to leave Fordham effective immediately, and today we learned that the school has fired head coach Dereck Whittenburg. 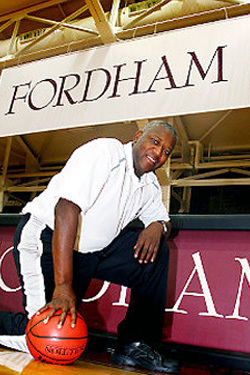 (You most likely know Whittenburg as the guy who took and missed this shot, but he'd been the coach at Fordham since 2003.) Assistant coach Jared Grasso will coach the team on an interim basis for the rest of the season. For an indication of how bleak things had gotten under Whittenburg, witness the elation over the news of his firing at alumni message board FordhamFans.com. Or, if you've got an afternoon to kill, read this Columbia J-School student's in-depth article on the state of the program, circa last spring. That article is called "Life at the Bottom," but they've since reached a new low. At least the only place to go from here is up.